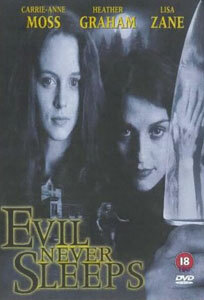 Evil Never Sleeps but you might if you make the mistake of watching this awkward, flat thriller. Olive (Heather Graham) is struggling to deal with the fact that her husband caught her with another man and shot the guy before turning the gun on himself. A mysterious old guy is stalking her but the police can't be bothered helping and her friend Pearl can't get through to her. The cast is full of familiar faces but the script and direction are off and many of the scenes just feel wrong. Whatever the film makers were aiming for here they missed the target by a distance. The film is boring and feels disjointed. It also doesn't really deliver any horror or thrills which isn't ideal in a horror/thriller.